Popular kits might take 2000 hours of work and for many people that means a decade of nights and weekends. There are quicker builds, though. Many of these aircraft are smaller single seaters. I am also considering one of these kits since it would get me into the air sooner and I can learn the skills before tackling a more complex aircraft. The downsides are that I’d only be able to fly by myself, there wouldn’t be any transition training so my first flights would be riskier, and I might not be able to fly out of the closer airports (legally and because of the higher winds). Backyard Flyer - The Backyard Flyer is really about as minimal as you can get and still have a full three-axis airplane. There’s a windshield but not enclosed cockpit so the pilot feels the wind. When I took a demo flight in a trike I was in the open like this and it was amazing! Flying low and slow and feeling the wind made flying so much more real than sitting in a Cirrus SR20 going at 5500 feet going 140 knots. If I had a large backyard in the country (someday, my friends, someday) I could takeoff there, no runway needed. AeroMax - The AeroMax is similar to the Backyard Flyer, but it looks more finished and it has the unique feature of being so skinny that the pilot’s legs dangle out of the sides. It’s more like you are wearing the airplane rather than sitting in a cockpit. Belite UltraCub - The UltraCub is even more finished than the previous two aircraft. 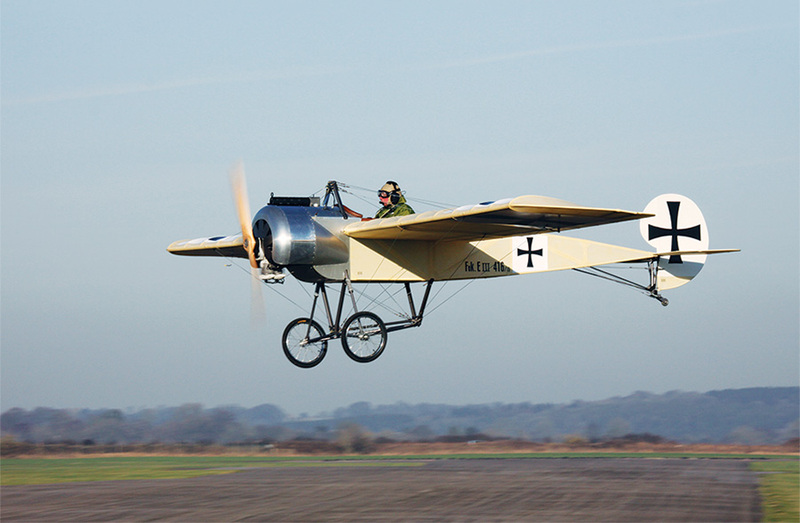 Fokker EIII Eindecker - This is a replica of a WWI airplane. I laugh everytime I think about building it because it seems so absurd. And it is absurd. I’m sure the flying characteristics are terrible. But it would be a damn cool aircraft to taxi up to the ramp in.